Automatic Migrations allows you to use Code First Migrations without having a code file in your project for each change you make. Not all changes can be applied automatically - for example column renames require the use of a code-based migration. You can intersperse automatic and code-based migrations but this is not recommended in team development scenarios. If you are part of a team of developers that use source control you should either use purely automatic migrations or purely code-based migrations. Given the limitations of automatic migrations we recommend using code-based migrations in team environments. Before we start using migrations we need a project and a Code First model to work with. For this walkthrough we are going to use the canonical Blog and Post model. Now that we have a model it’s time to use it to perform data access. Update the Program.cs file with the code shown below. 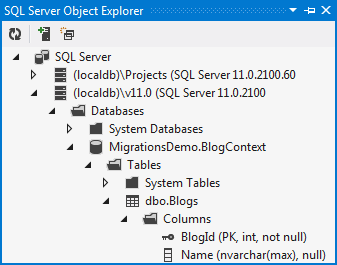 Run your application and you will see that a MigrationsAutomaticCodeDemo.BlogContext database is created for you. It’s time to make some more changes to our model. Let’s introduce a Url property to the Blog class. If you were to run the application again you would get an InvalidOperationException stating The model backing the 'BlogContext' context has changed since the database was created. Consider using Code First Migrations to update the database ( http://go.microsoft.com/fwlink/?LinkId=238269). As the exception suggests, it’s time to start using Code First Migrations. Because we want to use automatic migrations we’re going to specify the –EnableAutomaticMigrations switch. The Configuration class. This class allows you to configure how Migrations behaves for your context. For this walkthrough we will just use the default configuration. Because there is just a single Code First context in your project, Enable-Migrations has automatically filled in the context type this configuration applies to. Code First Migrations has two primary commands that you are going to become familiar with. We are going to avoid using Add-Migration (unless we really need to) and focus on letting Code First Migrations automatically calculate and apply the changes. Let’s use Update-Database to get Code First Migrations to push the changes to our model (the new Blog.Url property) to the database. Run the Update-Database command in Package Manager Console. The MigrationsAutomaticDemo.BlogContext database is now updated to include the Url column in the Blogs table. Let’s make another change and let Code First Migrations automatically push the changes to the database for us. Now use Update-Database to bring the database up-to-date. This time let’s specify the –Verbose flag so that you can see the SQL that Code First Migrations is running. Run the Update-Database –Verbose command in Package Manager Console. Now let’s look at something we might want to use a code-based migration for. We could just run Update-Database to push these changes to the database. However, we're adding a non-nullable Blogs.Rating column, if there is any existing data in the table it will get assigned the CLR default of the data type for new column (Rating is integer, so that would be 0). But we want to specify a default value of 3 so that existing rows in the Blogs table will start with a decent rating. Let’s use the Add-Migration command to write this change out to a code-based migration so that we can edit it. The Add-Migration command allows us to give these migrations a name, let’s just call ours AddBlogRating. Run the Add-Migration AddBlogRating command in Package Manager Console. The migration also has a code-behind file that captures some metadata. This metadata will allow Code First Migrations to replicate the automatic migrations we performed before this code-based migration. This is important if another developer wants to run our migrations or when it’s time to deploy our application. Our edited migration is looking good, so let’s use Update-Database to bring the database up-to-date. We are now free to switch back to automatic migrations for our simpler changes. Code First Migrations will take care of performing the automatic and code-based migrations in the correct order based on the metadata it is storing in the code-behind file for each code-based migration. Now we can use Update-Database to get Code First Migrations to push this change to the database using an automatic migration. In this walkthrough you saw how to use automatic migrations to push model changes to the database. You also saw how to scaffold and run code-based migrations in between automatic migrations when you need more control.